B'ESTFEST Summer Camp returns in 2013, between 5th-7th of July, on the shores of Pasarea Lake, in Tunari village (in B’ESTFEST Park, on the outskirts of Bucharest, the capital city of Romania). This year it will be a special edition, celebrating 7 years of B’ESTFEST, so the ticket price it’s also a special one: only 150 lei (approx. 33 euro) for a three day pass, offering access to another round of great live performances, crazy parties, lots of extra activities and of course, more fun! B’ESTFEST is the first Romanian international festival recognized in the music industry as one of the biggest events of its kinds in Central and Eastern Europe. It actually was the only Romanian music festival included in the Top 20 European Festivals (Times, 2009 & Guardian, 2011). B’ESTFEST also became a representative cultural brand for Romania, bringing over 200 artists from all around the world in front of more than 200, 000 people! Just 10 minutes drive from the airport, B’ESTFEST Park includes a generous camping space, one main stage, a secondary (rock) stage, a dance arena, as well as numerous other smaller stages, entertainment areas, bars & terraces featuring live shows, DJ sets, unconventional art exhibitions, creative workshops, relaxation spaces, games and hand-made fashion-fairs. One shouldn’t overlook the food-court either, with several traditional restaurants, serving the most delicious Romanian dishes ever! And just to be clear, B'ESTFEST Summer Camp 2013 is the best alternative for another year spent under the threatening global crisis: one of the freshest, coolest and most affordable music festivals in Europe at the moment! **Special offer for the fans from abroad: for every ticket that you buy, you get one for free! 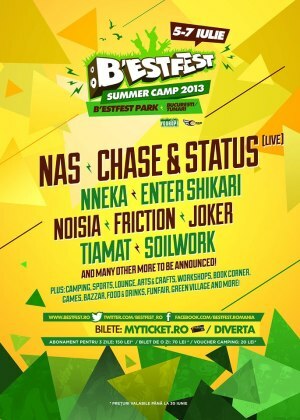 "B'ESTFEST Summer Camp 2013" Festival in Bucharest. You can get here description, reviews, address, time and details of "B'ESTFEST Summer Camp 2013" Festival in Bucharest. Visit Bucharest Tips for more Festival events in Bucharest!